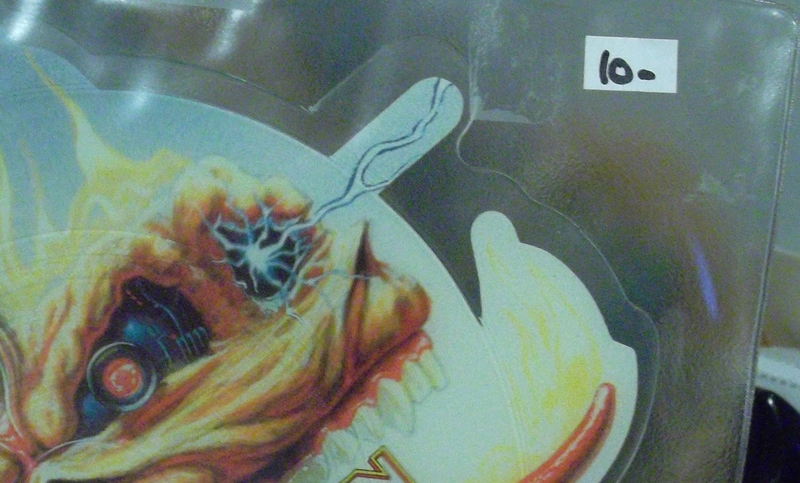 Part 9 of my series of Iron Maiden reviews! 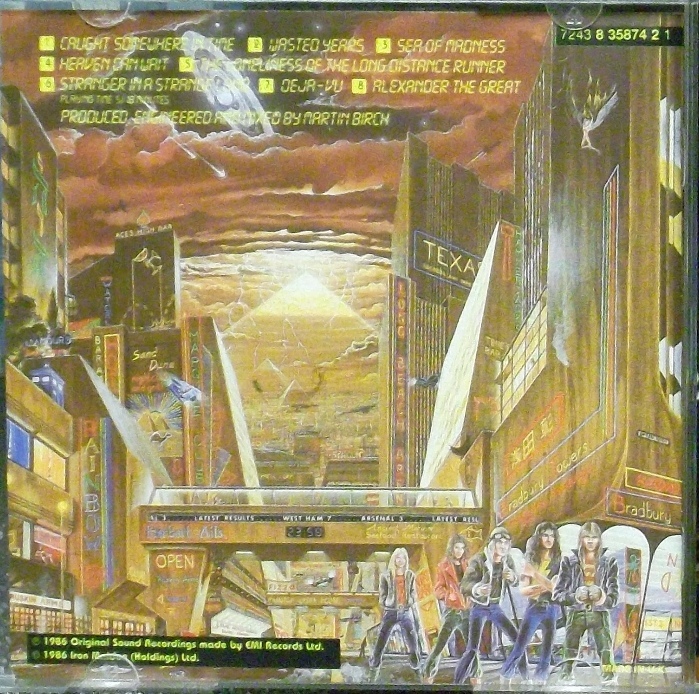 In spite of the lack of Bruce songs, Steve, Adrian Smith and even Dave Murray came in with enough songs for an album. They also came in with synthesizers for the first time. All three were credited with guitar or bass synth on Somewhere In Time, a sound that threw some of us for a loop. 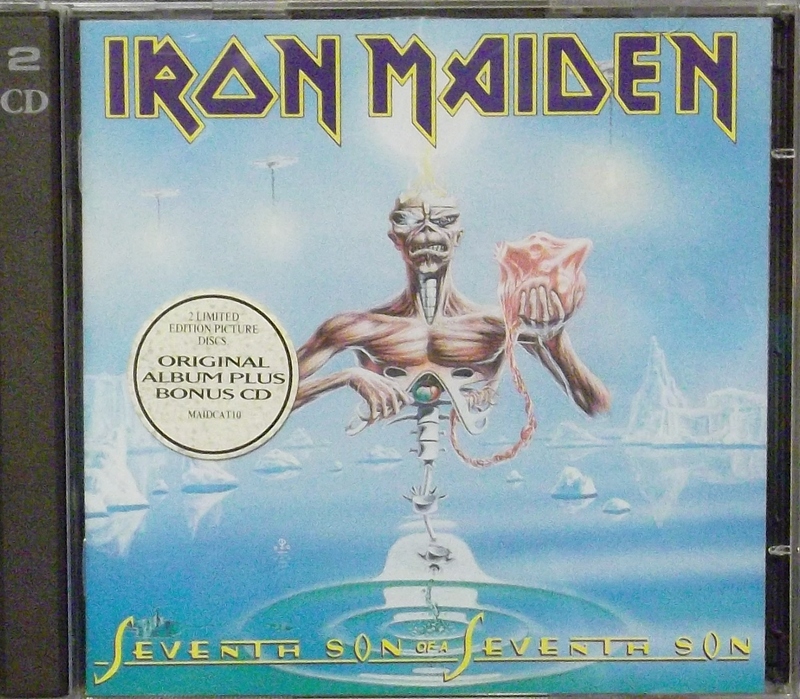 Also for the first time, Adrian would take sole writing credits on several Maiden songs (lyrics, music and all) which lent his more melodic bent to the resulting album. The production, again by Martin Birch, was paradoxically both cold, and warm. It’s a chilly sounding album, but the synths actually bring some warmth back to it. Unfortunately there isn’t as much guitar grit as before, everything sounding smoothed out. 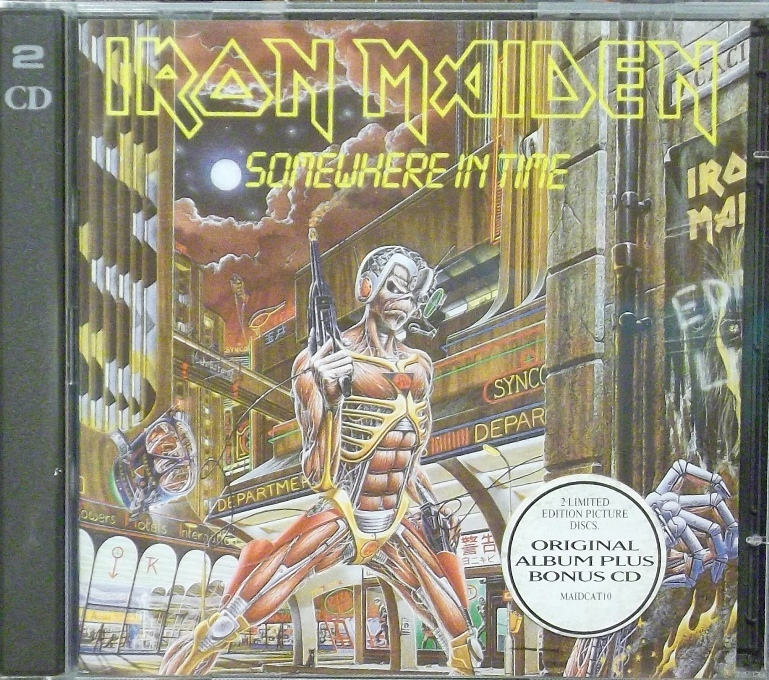 “Caught Somewhere In Time”, the excellent opener, starts right off the bat with synth; Maiden were laying their cards on the table. The gallop is still there and Steve still drives the Beast forward withi his bass. The synth doesn’t really detract from it. It is plenty riffy, and Bruce’s voice soars with the excellent chorus. This is a Maiden rocker to sing along to. Adrian contributed the first of the two singles: “Wasted Years”. 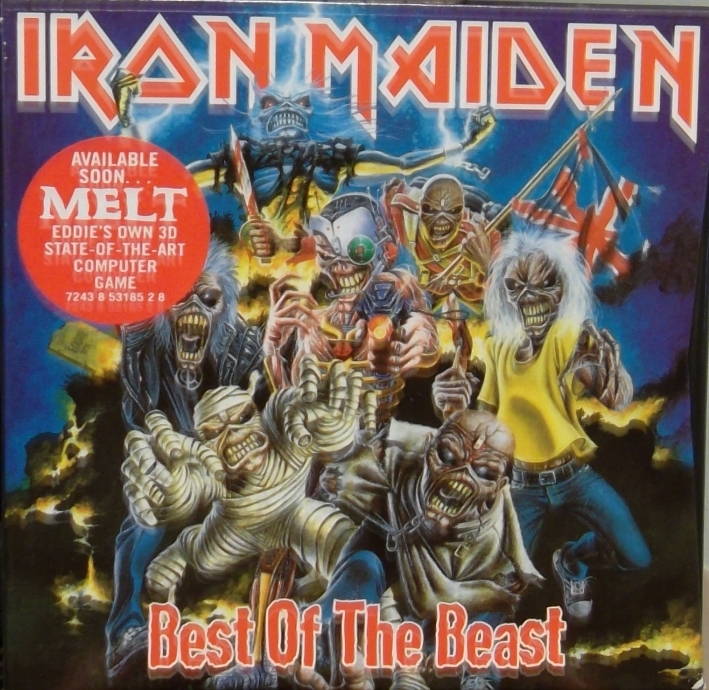 This classic song was my introduction to the new Maiden sound, since it came out a bit before the album was available. Not only was the video great (black and white footage of the band rehearsing with collages of Eddies and tour photos) but the song was also great. 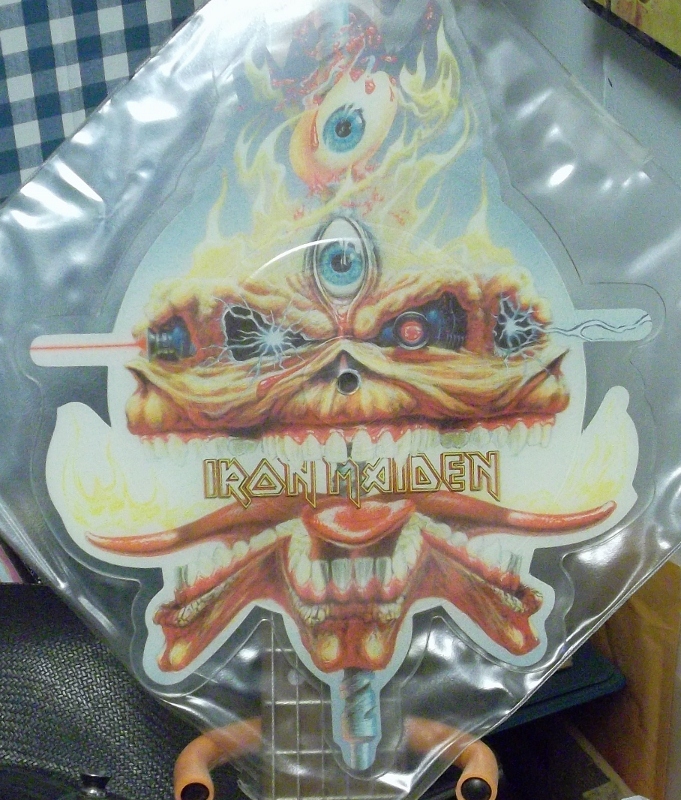 This is definitely hard rock Maiden, the kind of thing that made good Maiden singles, like “Flight of Icarus”. The lyrics, also by Adrian, are clearly about the road life and I’m sure Bruce could pour his heart into the words. 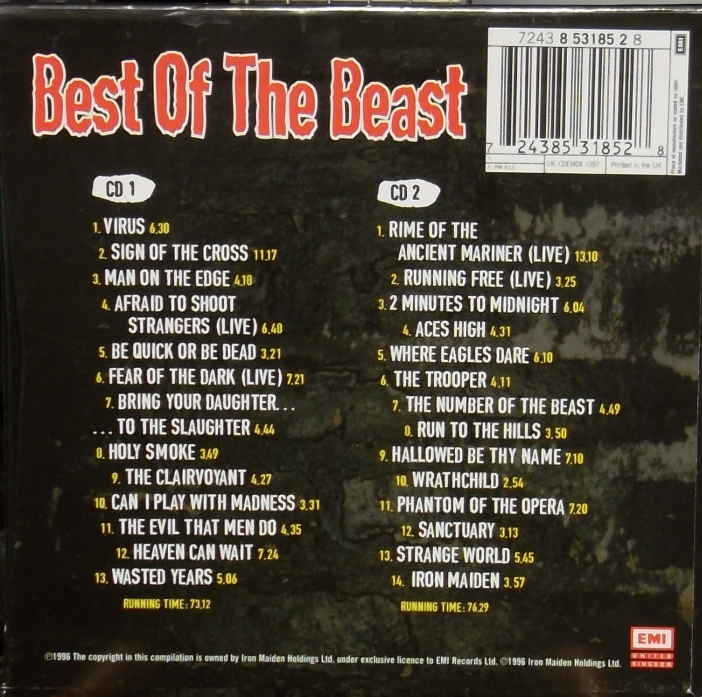 Two lacklustre songs follow: “Sea Of Madness” and “Heaven Can Wait”. Neither song have ever really blown me away, but at the same time “Heaven Can Wait” turned into a tour classic for many years so what do I know? It was the traditional concert spot for the crowd to sing along. 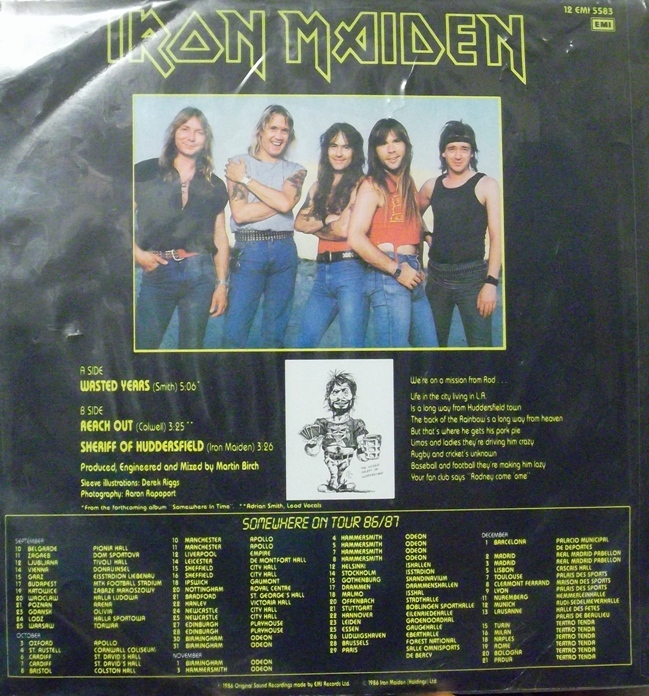 Smith contributed “Sea of Madness”, while Steve wrote “Heaven Can Wait”. I do like the slow part in the middle of “Sea of Madness”, with its nice solo. That ended side one. Side two started with “The Loneliness of the Long Distance Runner”, one of Steve’s longer songs. It was based on a short story of the same name, and I have to admit that lyrically it’s not one of those Maiden songs that really has me waiting to sing the next line. The choruses are pretty straightforward: “Run, on and on. Ru-uu-un, on and on. The loneliness of the long distance runner.” The synth in this song is effective although the song is arguably filler. The excellent “Stranger In A Strange Land” follows, the third of Adrian’s writing contributions. This was the second single, and a good choice it was. A catchy mid-tempo song, it took advantage of the textures of the new synths effectively. I’ve read in the past that it’s based on Stranger In A Strange Land by Heinlein, but I fail to see the connection. I always felt it may as well be about the 1984 film, Iceman. The lyrics fit. “Stranger” was also host to another excellent Adrian guitar solo. It was around this time that I bought a white guitar simply because Adrian played one in the video! 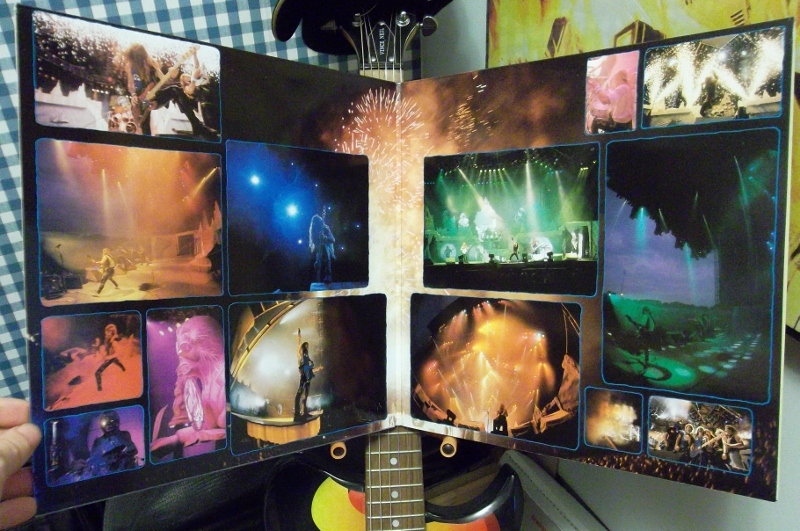 And yes, the video was an excellent summation of their stage show, with giant inflatable Eddie coming out of the stage! 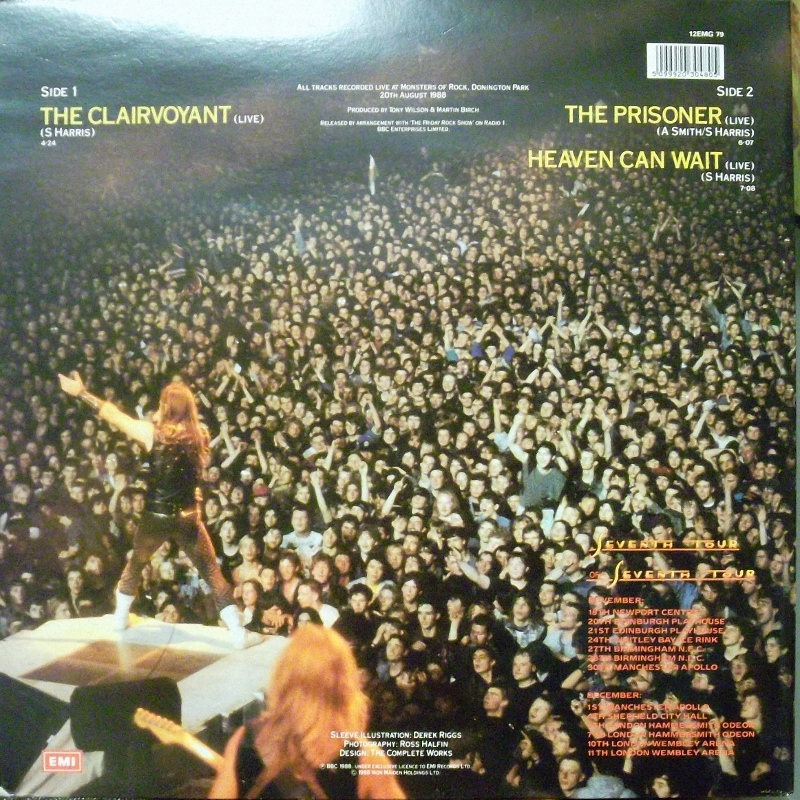 But alas, we are now at the end: The 8th and final song is yet another Steve Harris epic album closer. This time the topic he chose was “Alexander the Great”. Another historical topic for me to devour! I later majored in history. I wonder how much of that was due to my two greatest influences? 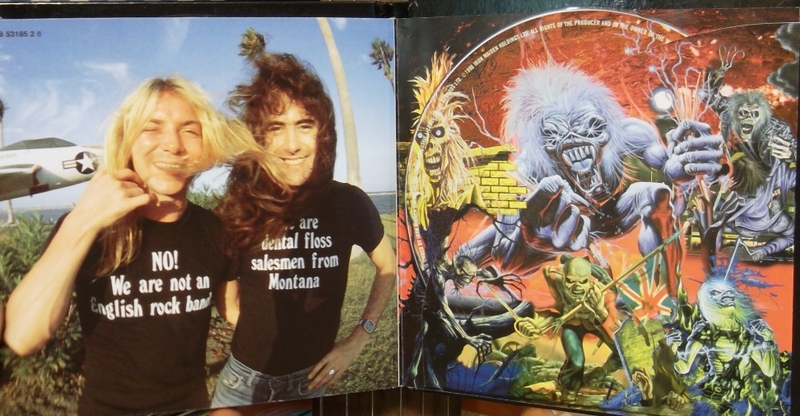 My dad, and Iron Maiden? 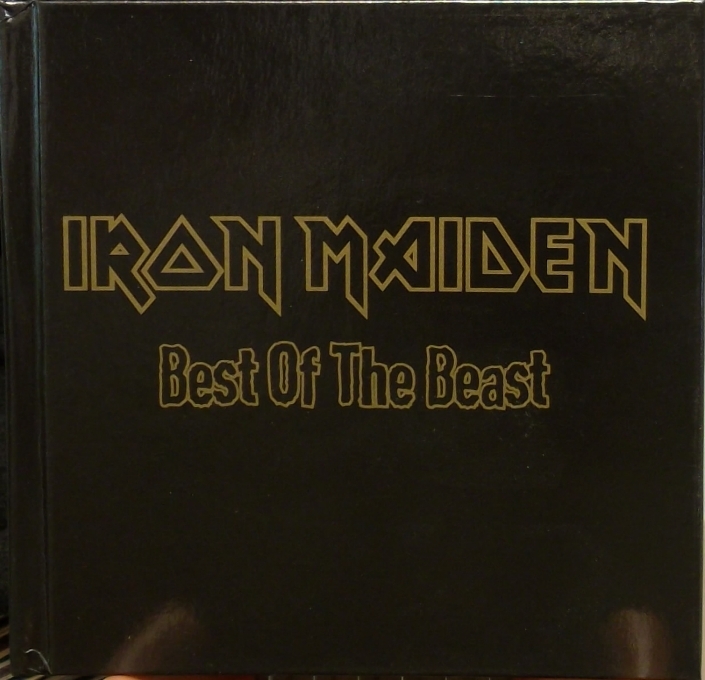 The choruses are awesome, and I consider this to be one of Maiden’s lesser-known triumphs. 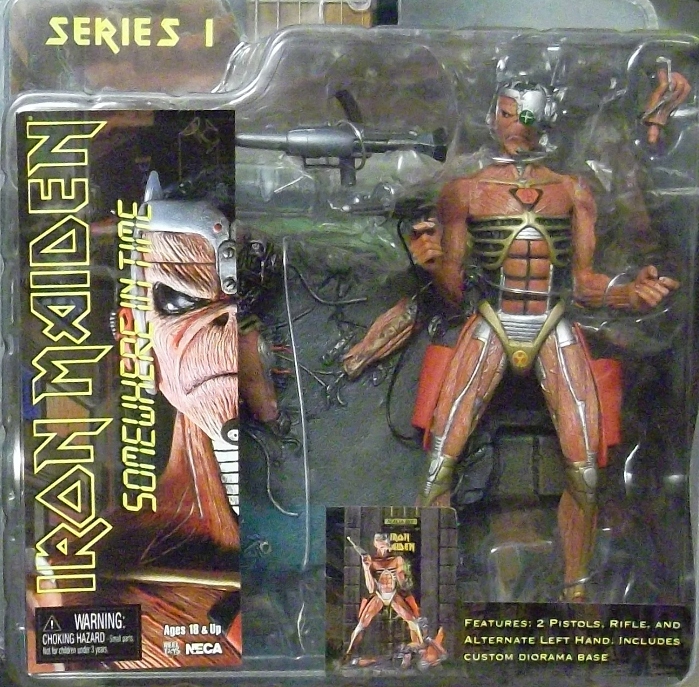 I imagined that after Eddie’s resurrection on Live After Death, he had emerged some time in the future (around the time period of Blade Runner, it appears) and gotten himself some cybernetic enhancements. The cover is, in essence, an updated take on Killers. Emerging from his Spinner, Eddie’s traded in his hatchet for a laser. 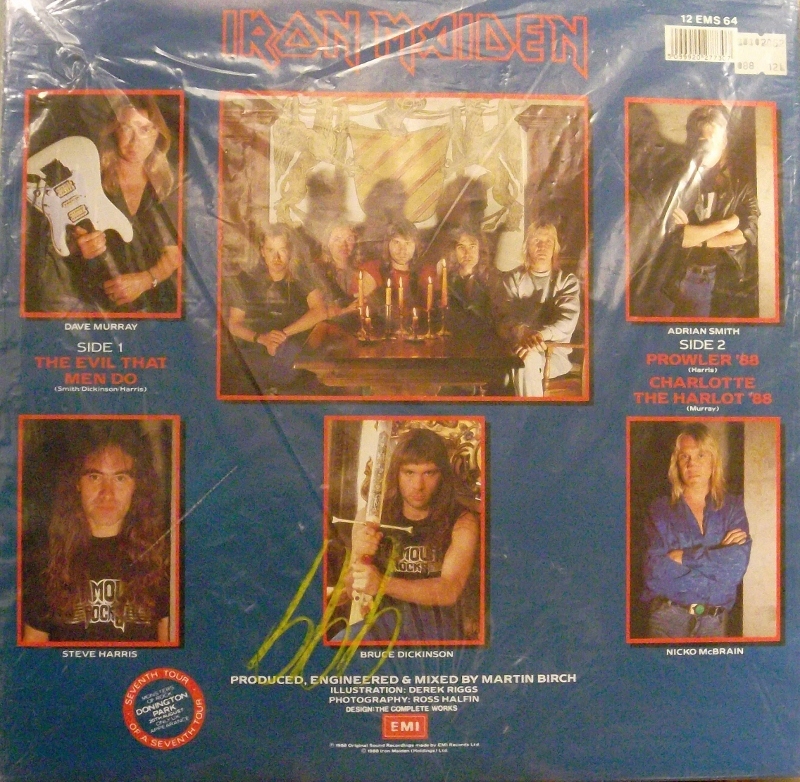 On the back, you can see the members of Maiden themselves witnessing Eddie’s deed. Notice Nicko’s goggles? He’d just got his pilot’s license! 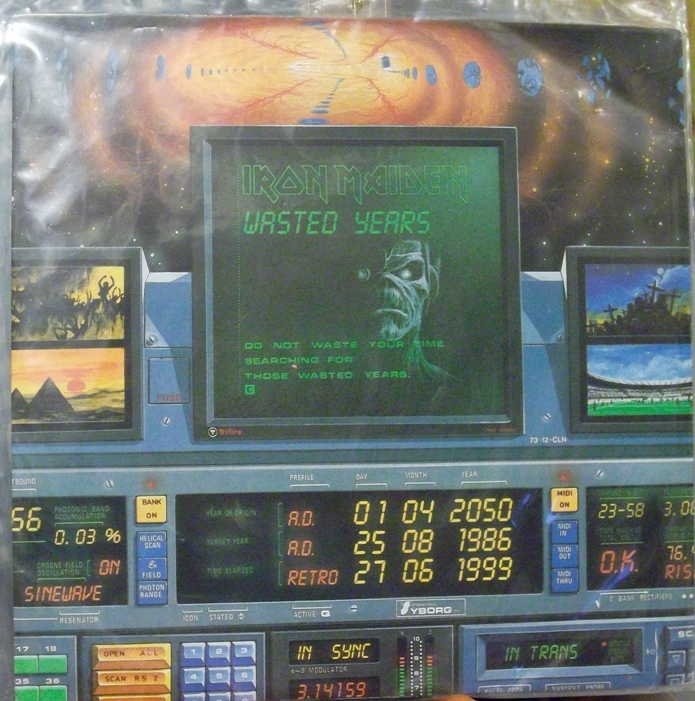 The artwork for the singles were equally awesome: On “Wasted Years”, we see Eddie travelling back in time to 1986…chasing the T.A.R.D.I.S.? Its B-sides were excellent! As far as B-side material goes, these were two of the best. “Reach Out” was a rare thing: A song written by an outside writer, Adrian’s buddy Dave “Bucket” Colwell who would later end up in Bad Company. 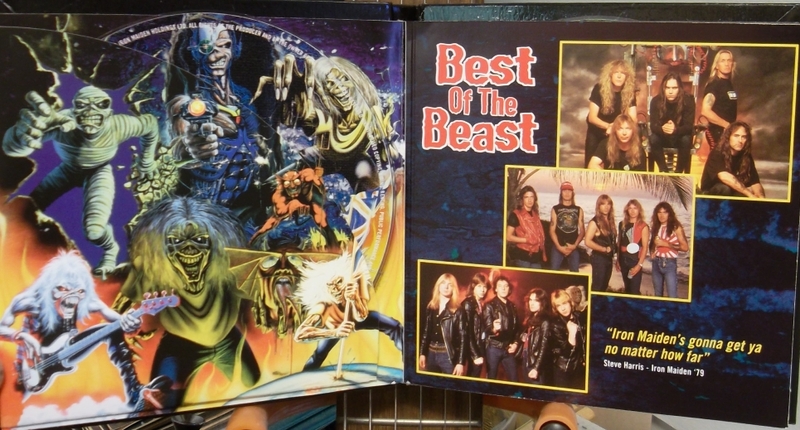 Perhaps even more astonishing was the lead vocalist: Adrian Smith! Martin Birch compared it to Bryan Adams-type rock, but fear not! Bruce shows up by chorus-time to blow you away with his wail, as he answers Adrian’s lines. Pure awesome in a nice sweet hard rock package. 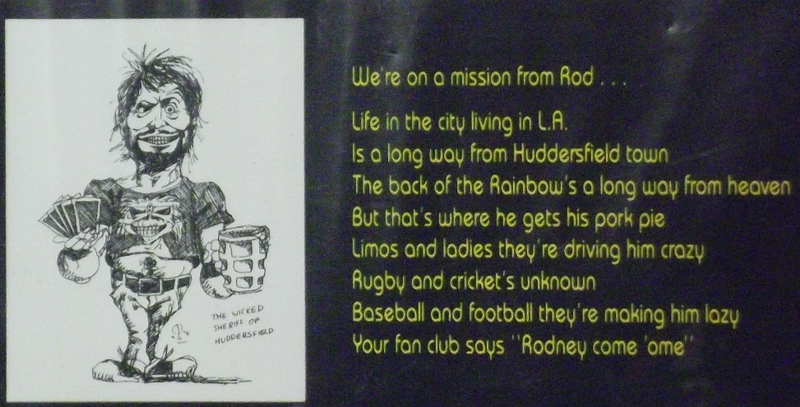 Then there was “The Sheriff of Huddersfield”, a not-very-complimentary roast of Maiden manager Rod Smallwood! “‘Rufus the Red’ has a crane by his bed, to wrench himself up in morn’, but if you dare to tread at the foot of his bed, you’ll wish you’d never been born!” Not a great song, it’s still pretty damn funny. Rodney, it seems, had fallen for the L.A. lifestyle and the band were not beyond giving him a hard time about it! 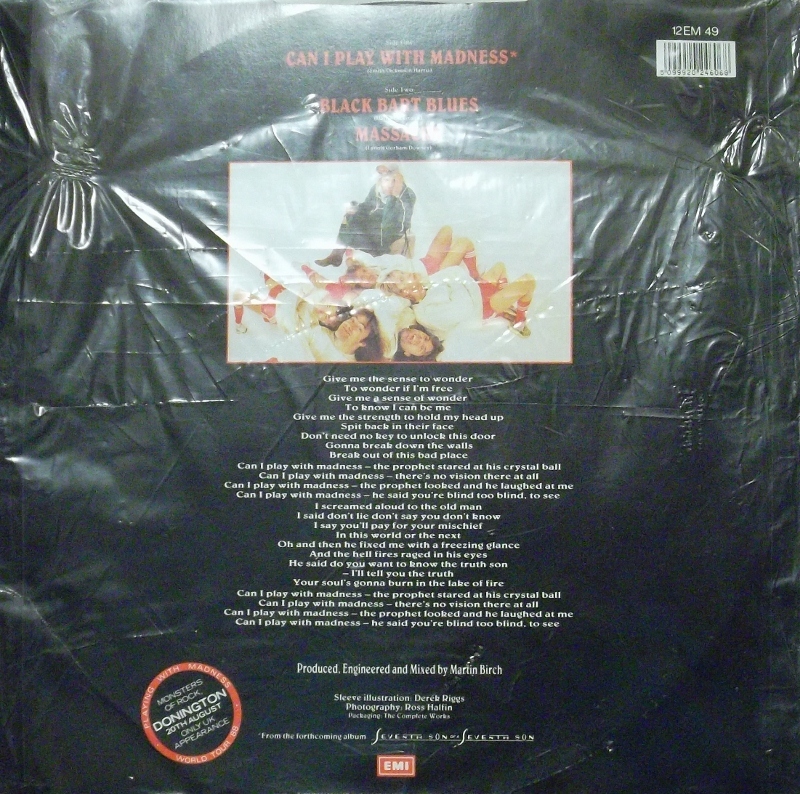 Its B-sides were two covers: “That Girl” (FM) and “Juanita” (Marshall Fury). “That Girl” is a pretty good hard rock song, very much in line with a song like “Reach Out”. I never liked “Juanita” much though. 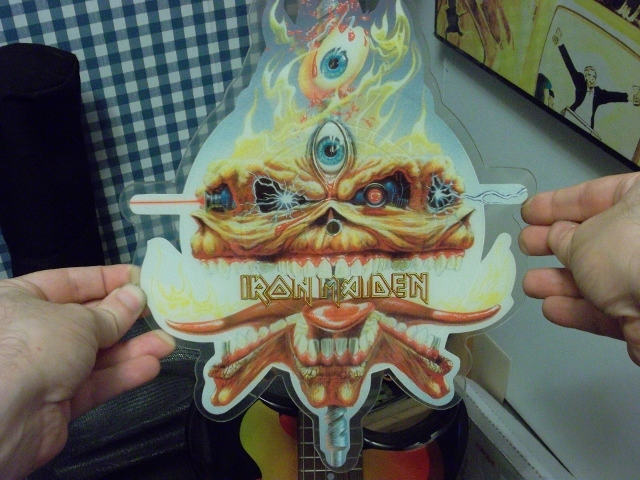 Don’t worry – Maiden’s arrangement is nothing like this! Makes you wonder why they covered it though. 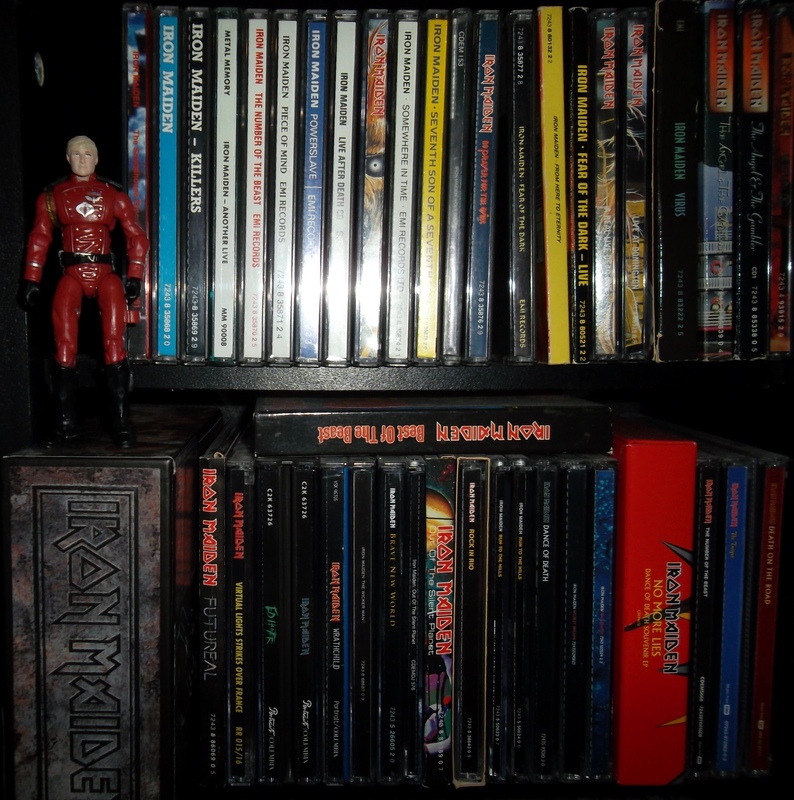 I have a real soft spot in my metal heart for Somewhere In Time. 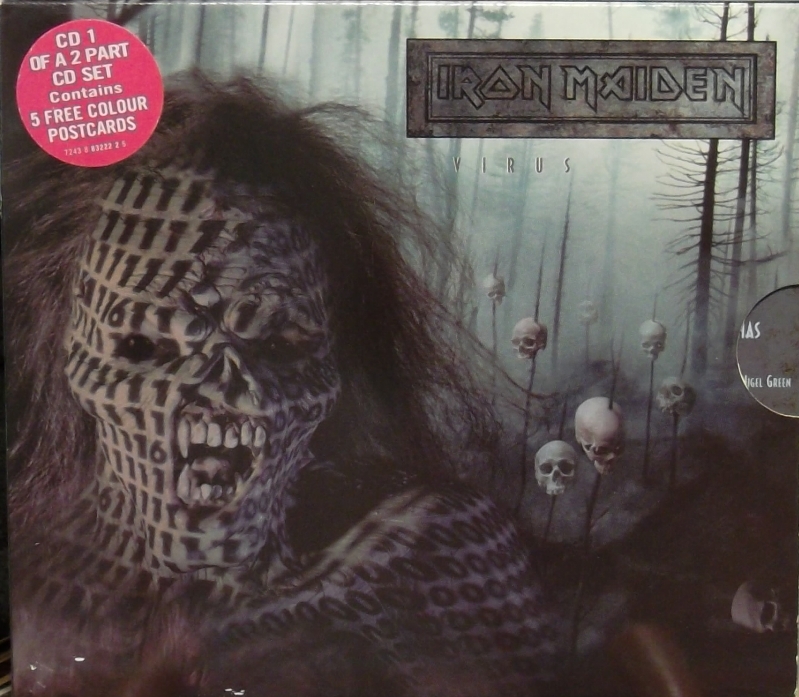 Although it sags a bit in the middle, and it’s toned-down Maiden, this is still one of my personal favourites. 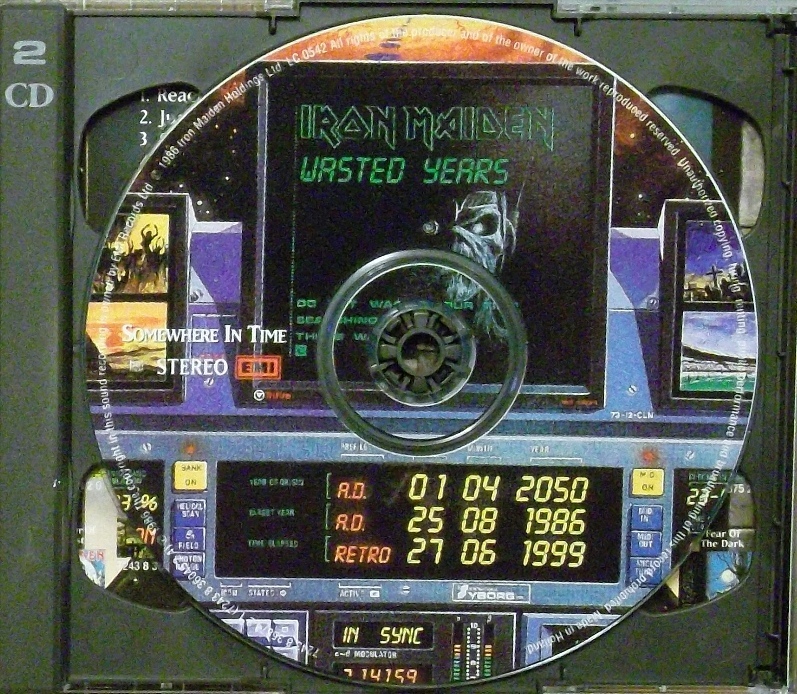 It came out when I first started high school, and you can’t compete with nostalgia. Although today many consider inferior to the albums that came before and the album that came after, I have to rate it pretty high.